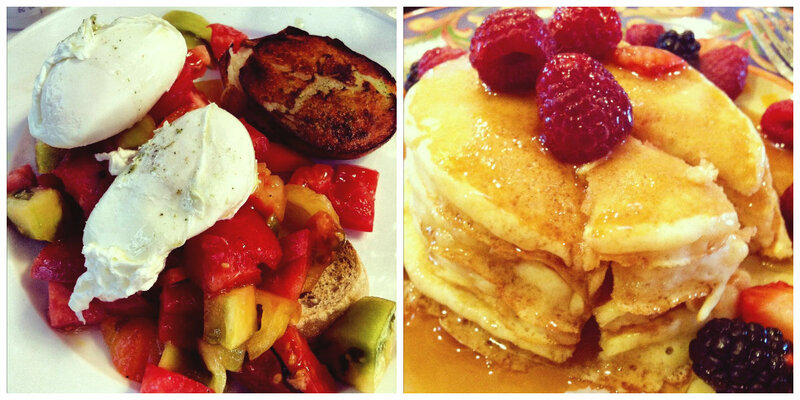 Breakfast is undoubtedly the most versatile and underestimated meal of the day. Think about it! Pancakes, waffles, french toast, sandwiches, grits, fruits, meat — you’re likely to satisfy both a sweet and savory craving in that one meal. Plus, you could eat any of those things at any point in the day. Who doesn’t love tapping into their inner child to have pancakes for dinner? The same can’t be said for filet mignon for breakfast (though, my sister routinely eats cold pizza for breakfast, so to each his or her own). If I had more time in the morning before work, I might spend it trying to perfect the art of egg-poaching to recreate an amazing bruschetta dish from Cora’s Coffee Shoppe in Santa Monica. Or I’d have my dad make his famous pancakes for me every morning. The only time I don’t want a massive breakfast of eggs drowning in hollandaise (I don’t care what Bourdain says about it) or round discs of bread smothered in syrup is when we’re on vacation in Nantucket. Breakfast on that island consists of lattes from the bean and cherry scones from the local bake shop every single morning. Scones are my one pastry vice because they’re not overly sweet and sugary, even if I do have an insatiable sweet tooth. 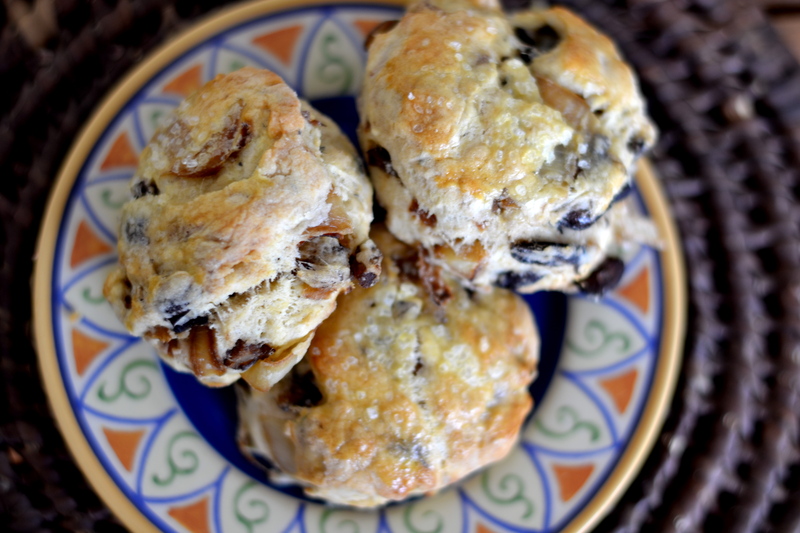 Until Molly and I came upon this recipe, savory scones had never crossed my mind. 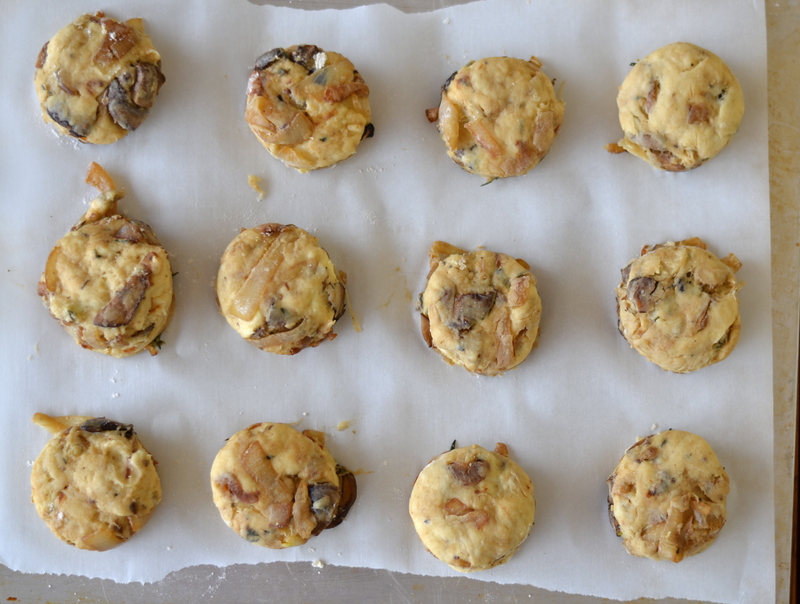 Now that I have made these mushroom & onion scones a few times, they have now become a staple in my repertoire. Enjoy them plain with a pad of butter, toasted with a slice of cheese, or on either side of a fried egg to make a mean egg sandwich. Over medium heat in a medium pan, heat 1 tablespoon of olive oil and 1 tablespoon of butter. Add mushrooms to pan and saute, stirring periodically until browned. Add salt and pepper, remove mushrooms from pan and set aside. Add 1 tablespoon of olive oil and 1 tablespoon of butter in the same pan. Add the onions and cook down until onions become caramelized. Add mushrooms to the pan, followed by balsamic vinegar, salt and pepper. Put aside to cool and be patient– the mushrooms and onions need to be completely cooled before they’re added to the dough. In a small mixing bowl, beat egg and buttermilk together and set aside. In a large mixing bowl, sift dry ingredients — flour, sugar, baking powder, basking soda, and salt. Add butter and shortening and mix together until the butter and shortening resemble small pebbles. Add egg and milk mixture to dry ingredients, bringing ingredients together to form a soft dough. Add mushrooms and onions to dough until evenly incorporated. Place dough on floured countertop and knead approximately 15 times. Form dough into a round about 1-inch thick and cut dough into 2-inch rounds using a biscuit cutter or upside-down drinking glass. Repeat with excess dough until everything is used. Place scones on parchment-lined baking sheet. Brush with egg wash and top with coarse sea salt. Bake at 425 degrees F for 12-15 minutes. Scones are best right out of the oven!